Providing you the best range of circular electromagnetic lifter and magnalift circular electromagnetic lifter with effective & timely delivery. Our organization has risen to prominence in offering Circular Electromagnetic Lifter to our clients. Circular Electromagnetic Lifter is available in various dimensions as well as designs. It is preferred on account of attributes such as robust construction, durability, high magnetic strength and many more. Offered range is appreciated for its design as well. The complete gamut is fully tested on different aspects of quality factor. Control panels with over-excitation controls are also supplied for higher duty cycle operation and lifting extra load from smaller magnets thus enhancing the economic aspects of the lifting capacity, particularly for scrap handling. Non Linear Resistors for surge suppression. Lead Acid/Ni-cd Battery Back-up with Charger. 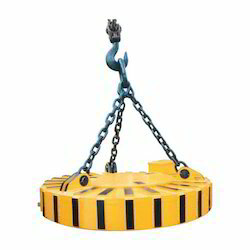 Self coiled cable reeling drum available for different lifting height. Other Operating Voltage on request. Optimum cross section combined with high magnetic flux produced ensures maximum lifting capacity with respect to the magnet self weight. Easy operation, only single operator required. Manufactured with Cast Steel body and/or Fabricated structure. Aluminium/ Copper/ Anodised Aluminium Conductor wound coil, special “H” or “C” Class insulation. 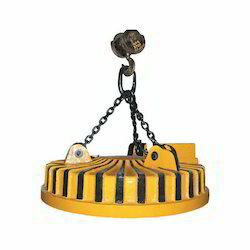 Our organization has set benchmark in offering Magnalift Circular Electromagnetic Lifter to our clients. Provided assortment is produced by employing best material and excellent components which has been procured from reliable vendors of the market. Magnalift Circular Electromagnetic Lifter is appreciated for its excellent functionality and design. Provided product is stringently checked by our adept quality controllers team prior to delivery phase in the market. Special Heavy Steel Mill Duty Series with Heavy Duty Manganese Casting Bumper Plate with deep field design, Higher Duty Cycle for enhanced Magnetic Operation and Higher Lifting Capacity. Loading/unloading of steel scraps/pig irons/ cast iron boring/broken steel from trucks. Handles slabs, blooms and ingots. Used in smelt mixing operation. Direct feeding in the furnace. Looking for Magnetic Lifter For Scrap Handling ?